Heating coal over 1100 Co in the absence of oxygen produces metallurgical coke. This process provides both heat and carbon (coke) required for iron production. During this process the volatile materials contained in the coal are driven off, leaving coke as the product. Gas produced by coking is withdrawn by means of blowers to recover energy-rich byproducts, including methane. Ammonia stills are the principal means of recovery. Recycled scrubber water is used as a coolant. Scrubber waste streams contain tars, organic matter, sulfides, cyanides, inorganic salts, suspended solids, phenols, and ammonia. Treatment of this wastewater involves removal of suspended solids and chemicals that are toxic to biological systems, followed by biological treatment. Coking wastewater is fed into a rectangular decanter to remove large particles, including tar. Wastewater exiting the decanter is treated with polymer and coagulant before entering a primary clarifier. The primary clarifier facilitates suspended solids settling out from the wastewater stream. This unit is normally covered to prevent the escape of ammonia and volatile organics, which are regulated by EPA and may be explosive. It has lower operating costs. It is easier to operate since no blowers are needed. The combination of fixed film and activated sludge makes the system more robust and more resistant to toxic shock. Wastewater exiting the STM-Aerotor™ flows to a COP™ Clarifier for organic matter removal. COP™ Clarifier underflow is split into return activated sludge (RAS) and waste activated sludge (WAS). RAS flows to the STM-Aerotor™, while WAS is sent to a thickener. COP™ Clarifier effluent may be recycled or safely discharged. This effluent may also be polished by a multimedia filter for better clarity. The primary clarifier’s underflow and the waste activated sludge from the COP™ Clarifier are treated with polymer and then fed into a thickener to thicken the solids. The thickener effluent overflow is recycled back into the primary clarifier. The thickener’s underflow is again treated with polymer and sent to a filter press for dewatering. Filter pressate is recycled back into the primary clarifier while the solids are disposed of. Industry uses steel cold rolling to harden, reduce thickness, and provide special finishes on steel. Acidic, alkaline, and oily wastewater are discharged during cold steel rolling. Non-degradable organic pollutants are emulsified in the discharged wastewater. These contaminants are introduced by rolling, coating, annealing, pre-pickling, and alkaline cleaning of the steel. Differing steel varieties may also contribute zinc, nickel, copper, tin, chromium, and iron. The waste streams are combined and aerated to oxidize sulfide to sulfate and ferrous to ferric ions. This decreases their solubility. This step can also provide some preliminary pH adjustment as the rinse stream reacts. Aeration basin effluent is then sent to the high density sludge (HDS) reaction tank. Here it is mixed with slurry composed of fresh lime and recycled sludge. HDS systems precipitate metals in acidic streams. Recycled sludge mixes with fresh lime slurry in the HDS tank. Sludge particles are coated with lime as pH rises and flocs form. The HDS stream is fed to a Solids CONTACT CLARIFIER™. An internal sludge recycle rate of up to ten times the inlet flow rate facilitates the reaction. The combination of sludge recycling with lime addition reduces heavy metal levels down to dischargeable limits. Solids CONTACT CLARIFIER™ effluent is pumped to pressure filters to remove any remaining suspended solids. Activated carbon or biological treatment units may be added if organics are present. 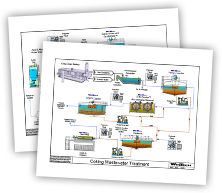 Process sludge is sent to a thickener for densification prior to dewatering. Dewatering may be accomplished using a filter press, belt press, or rotary vacuum filter. A rotary vacuum filter is depicted here. It has the advantage of semi-continuous processing, very dry cake production, and minimal chemical addition requirements. Scale removal effluent contains suspended solids and coarse scale. Iron oxides are allowed to settle in a sedimentation basin. Oils rise to the surface and are removed with skimmers and discharged to a collecting basin. Rolling process coolant streams are also collected, treated, and recycled. Coolant and lubricant streams emerge as emulsions. Emulsion breaking may be accomplished by thermal, chemical, or physical means such as a dissolved air flotation (DAF) or induced gas flotation (IGF). Separation of water and oily phases follows. Electrolytic chemical pre-pickling processes necessitate additional effluent treatment. This typically incorporates chromium (VI) reduction using sodium bisulfite or iron compounds. This converts the chromate to chrome (III) which is much less hazardous and easier to precipitate. Since the 1960s, continuous casting has become increasingly important in modern steel production. Today more than 80% of the worldwide production uses this process. Liquid steel flows out of the ladle into the tundish, and then into a water-cooled copper mold. Solidification begins in the mold and continues through the caster and the strand, as it is now called, is straightened, torch-cut, and then discharged for intermediate storage or hot charged for finished rolling. During the continuous casting process, water and oil are used as coolants. As the steel cools and solidifies, a scale forms on the exterior. This scale, as well as the oil used to cool the steel, combines with the water used in continuous casting to form a wastewater stream. In addition, the caster mold sections are held in place by a high pressure (2,000 psi) hydraulic system. It is not uncommon for a hydraulic line to break, sending hundreds of gallons of hydraulic fluid into the wastewater collection system. Because the wastewater contains these high amounts of scale, particulate, oil, and other possible contaminants, it must be treated before being reused. Initially the wastewater is sent to a scale pit with an oil skimmer and solids scraper. The scale pit is used to remove the larger scale and particulate, as well as to skim the oil from the water and is normally sized for 30–45 minutes of retention time. In some mills, this pit also receives wastewater from the hot roll and other miscellaneous processes throughout the mill. This can contribute organics, heavy metals, and other contaminants to the scale pit which must be accounted for in any treatment process. The pretreated wastewater is then sent to deep bed filters. These filters normally have a single media consisting of a course media bed. The deep bed filters are used to remove the fine particulates suspended in the water and to coalesce the remaining oil. The treated water from the deep bed filter is sent to a cooling tower prior to being reused in the continuous caster process. In order to reuse as much water as possible, the deep bed filter’s backwash water is further treated. This water stream is treated by a thickener which is followed by a filter press. The underflow from the thickener enters the filter press. The effluent from the thickener and the pressate from the filter press are both recycled to the scale pit. The EPA is currently revising the water effluent guidelines for the iron and steelmaking industries. These revisions may result in a reduction in the allowable limits for discharges from the continuous caster water treatment facilities. It is expected that these changes will reduce the discharge limits of metals such as nickel, chromium, lead, and zinc, and could well require additional water treatment equipment for continuous casting operations. Chromium is present in the wastewaters of a number of industries, including: stainless steel manufacturing, protective coatings on metal, magnetic tapes, chrome plating, tanneries, textile dyes production, pigments and paint production, production of cement, paper, rubber, etc. Chromium is typically precipitated in two steps: reduction and precipitation. In the first step (Reaction Tank #1) acid is added to lower the pH to < 3 so that the reaction may take place. The reaction is conducted in Reaction Tank #2 where hexavalent chromium (Cr+6) is reduced to trivalent chromium (Cr+3). In this step, compounds such as ferrous sulfate (FeSO4), sodium bisulfite (Na2S2O5), or sulfur dioxide (SO2) are used as reducing agents. The trivalent chromium is precipitated as Cr(OH)3. In the second step (Reaction Tank #3), lime is typically used for the precipitation reaction. In this flow diagram, a process known as high density sludge (HDS) is employed to help promote precipitation. The heart of the HDS process is the pH in the HDS or densification tank which needs to be at a pH of 11.5 or higher. A change of state takes place at the higher pH and the process works better. The actual precipitation of chrome hydroxide takes place under mildly caustic conditions. Thus, there will always be some Cr(OH)3 in the clarifier feed, but these hydroxides will eventually be recirculated through the densification tank and undergo a change of state. In this process, previously settled sludge is recycled to the reaction tank (HDS tank) where it is mixed with fresh lime slurry. This lime slurry coats the sludge, making it more reactive and able to form stable flocs with the incoming solids in Reaction Tank # 3. The effluent concentration is 0.2 ppm Cr at pH 7.5. If additional metals are present, the pH is raised to approximately 10 to promote further precipitation. To further facilitate removal of additional metals, carbonate co-precipitation is sometimes used. Carbonate precipitation takes place only if free carbonate ions (CO2-3) are present and this occurs only if the pH is high. Some wastewaters, especially those with lead, cadmium, nickel, etc. which can form insoluble carbonates that can be used in carbonate precipitation, may already contain enough carbonates to allow precipitation to occur. Alternatively, inorganic carbonates such as soda ash (Na2CO3) can be added. High pH’s also promote the precipitation of the metals as hydroxides. Hence, carbonate precipitation is often a co-precipitation. As mentioned above, carbonate precipitates settle and can be dewatered more easily than the corresponding hydroxide precipitates. Note that pH values above 10 promote the formation of metal hydroxy complexes that can increase the metal solubility and reduce the precipitation effectiveness. The treated water is then filtered by either pressure or gravity media filters depending on the logistics of the final disposal. The sludge from this process typically goes to a conventional thickener and filter press for dewatering prior to disposal. Dewatering produces an average 20:1 reduction in sludge volumes. The water from the dewatering system is returned for processing. Variations of this process can be used to precipitate most heavy metals.